Insects (and their relatives) are probably not the first thing on people’s mind right now. However, getting the crop planted probably is. Soon thoughts will turn to pest management. Although too early to tell what will happen, it never hurts to think ahead and prepare for what could be. I don’t think I’m going too far out on a limb to suggest this might be a year with significant slug damage in corn and soybean. The weather we have been experiencing (and had last fall) certainly suggests early season scouting for slugs will be important. As usual, fields which had high slug populations in 2016, are no-tilled, have high amounts of residue or are unusually wet would be first on my list to scout. Fields that are following a small grain and/or cover crop would also be good candidates. Several of our cultural management strategies have been already been made (primary tillage, rotation) or may not be feasible (early planting). 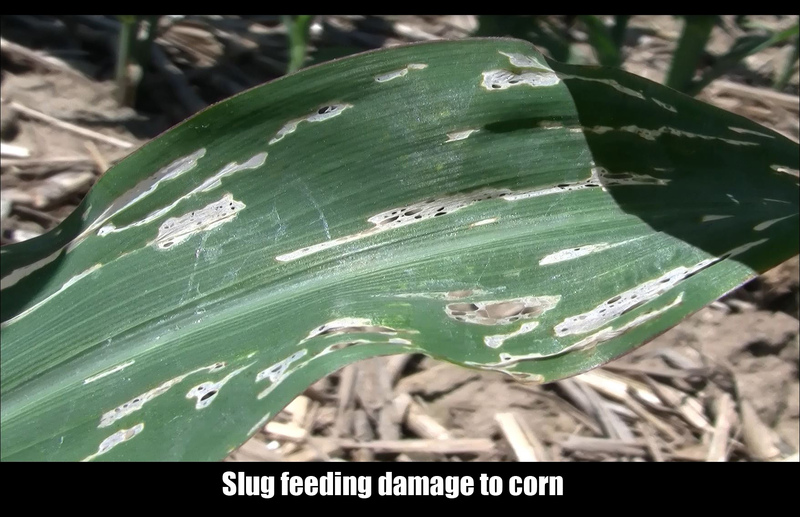 If you had fields with high slug activity in 2016, consider planting corn rather than soybean if that option is available as would be increasing the amount of secondary tillage if practical. In season management will be difficult and expensive so any preventative management you do will help significantly. Using slug baits as rescue treatments will have questionable results as a stand-alone treatment especially if slug damage is heavy. Cost effectiveness will certainly be an issue but so is the possibility of stand loss. Read labels carefully! The baits using the active ingredient metaldehyde are NOT labeled for soybeans grown in Wisconsin. A quick, if not hasty read of the label, may indicate otherwise. However, a footnote indicates that Wisconsin is not on the list of approved states for use. DATCP’s survey personnel have indicated very high black cutworm moth counts in their pheromone traps and Krista Hamilton has indicated these counts are ahead of last year’ numbers. Remember those nice spring days and warm southerly winds we had several weeks ago? Well, the downside is they brought some hitch hikers along. High trap counts are not always a good predictor of field damage. However, they do give us fair warning that the potential is there. Concentrating scouting efforts on high risk fields would be my suggestion. Those fields would be corn planted into soybean residue, fields with dense broadleaf weed populations and perhaps low areas along stream banks, etc. The outlook looks good for corn planting in the near future. However, late planted fields will also be at risk of black cutworm damage for a longer period of time. True armyworm catches have been low according to WI Pest Bulletin. Other states have reported locally heavy adult flights. Crop stage and arrival of armyworms is not as critical as it is with black cutworm. Therefore, the threat from this migrating generation of armyworm can last longer into the spring than for black cutworms. Experience tell us that early season damage is often more localized than the summer generation and damage is often very dependent on oviposition preference. These preferences include corn planted after grassy cover crops including cereal rye and corn planted into fields with an abundance of grassy weeds. Although not a grass, corn no-tilled into alfalfa can also be very attractive. Include wheat fields in your scouting efforts as well. Focusing efforts on these high risk fields is not fool proof, but if you have limited time, these hints can be helpful. Alfalfa weevil damage potential is difficult to predict. Fortunately, degree days can predict egg hatch and I would guess that will start soon in the southwest part of the state as well as in the warmer sandysoils on south facing slopes along the Mississippi River. Early symptoms of alfalfa weevil feeding are small pin-hole sized holes in the upper leaves. Although extensive damage is not usually expected until larvae reach the 3-4th instars early scouting will give you a heads-up and time to prepare. Next post: Cover Crops Becoming Your Next Weed?